When you use your boat, you get it dirty, plain and simple. 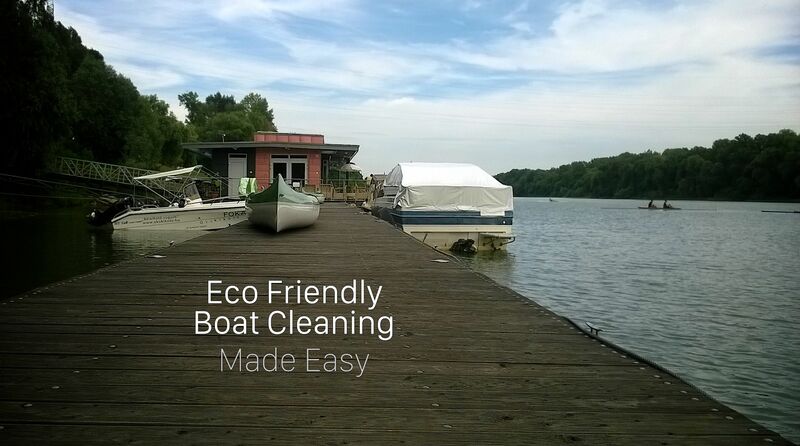 While cleaning your boat will be a constant for as long as you own it, there is one thing you can do to make cleaning your boat safe, quick and easy: choose eco-friendly cleaning products. It is possible to mix up a few batches of cleaner that will cost you next to nothing and have no environmental impact on our local waters. Let’s look into natural cleaning remedies for all types of marine messes. There is a condiment that’s no doubt sitting in your kitchen cupboard as you read this that will work wonders in the upkeep of your boat’s cleanliness – white vinegar. This all-purpose liquid breaks through the dirt on most items, including your boat. This is mostly due to the fact that it’s 100% natural and made from fruits or starch, meaning that there will be no chemical induced streaky marks left behind. Another non-toxic and natural product that’s used to clean almost everything within the eco-community is baking soda. The chemical name, sodium bicarbonate, is a compound found in all living organisms, and its job is to help maintain pH, or acidity/alkalinity, which in turn, breaks down the dirt in a way that not many other cleaning products seem to do. The last natural cleaner that we’re going to look at is the lemon. Yes, you probably have one or two kicking about in your fruit bowl. So, if you do, get chopping as lemons are fantastic at making things sparkle. Not to mention they smell zesty! Now that we’ve looked at natural, at home ingredients, the fun part begins – the mixing! Simply use an empty spray bottle to pour white vinegar and lemon juice into. The spray bottle provides an easy way to get the liquid onto your boat while the added zest of lemon will create a nice aroma and a sleek shine. If you’re looking to polish stainless steel, make a baking soda paste. Alternatively, if you give it some elbow grease, you can remove spots with vinegar. Remember, all of these methods are safe and good for the environment. They include no nasty chemicals and won’t cause any damage to your boat. Let’s look at a few specific types of marine surfaces with ideas on how to use green cleaners for each one. Stainless Steel: It is believed that stainless can be polished with a baking soda paste, or remove spots with the vinegar. Fiberglass: If you have a stubborn stain on fiberglass (or, more correctly, gelcoat) try using baking soda paste there as well. Sinks: Try bringing the sheen back to your sink by scrubbing with baking soda. If you need to get a little more aggressive, try adding some salt for brushed finishes. Drain Pain: Baking soda is good here. For general maintenance, pour some down your drains and rinse with hot water. This will help to flush odor-causing residues from the plumbing and even helps knock the scum out of your shower sump. And if you develop a clog, try this before going with harsh drain openers: Start heating a cup of vinegar in the microwave. Pour a cup of baking soda down the drain, followed by the cup of vinegar. Let this sit for a few minutes, then flush with hot water. Garbage Cans: Sprinkle baking soda in the bottom of the container before putting the liner back. This will help neutralize odors. Microwaves: Heat a cup of vinegar until it starts steaming. The acid and heat will loosen food that might have spattered while cooking and can be finished off with some warm, soapy water and a towel. Salt Stains: In addition to salt being a good scouring agent, you might be able to prevent stains from a wine or other beverage spill. Just dump the salt directly on the stain and let it absorb it. Vacuum with a wet/dry vac and reapply if necessary. Carpet: To eliminate odors and help remove dirt particles, sprinkle corn starch or baking soda directly on the carpet. Let it sit for at least half an hour and vacuum. Simple and effective!